Changing of Visa profession or MOL KSA Iqama profession is necessary for those whose Iqama profession or muqeem card profession is different from their work. It is illegal to work different from your Iqama profession in Saudi Arabia. Jawazat people can raid any time at any company in case you caught you can be detained. While requesting for changing MOL KSA Iqama profession you can check the benefited professions in Saudi Arabia and choose the best which matches your work. Benefited in the sense inviting your family either in visit or permanent etc. 1. Attestation of higher degree certificates from Saudi embassy and Saudi culture in your home country. Refer this article "Saudi Embassy Attestation procedure". 2. Your attestation degree certificate should match with the Iqama profession you are applying for. Recommended article "How to Check your muqeem Profession". 3. Request for change of profession in HRD department of your working company, required a deposited amount of 1000 Saudi Riyal for change of profession. 4. Change of profession may rejected if your Iqama profession is at lower side for example labor, driver, helper etc., Instead of this "benefited muqeem professions" list. Reasons for Rejecting profession change on your Iqama / Visa. 1. If your Iqama profession is at lower profile side (Labor, Helper etc,.). 2. If any Traffic violations against your sponsor or employee. You can always check your "traffic violations on Muqeem card" through MOI website. 3. No sufficient funds (Fees) are present for change of profession. 4. If your request did not approve from the ministry of labor. 5. If you are Driver, Housemaid, Helper, Labor etc. for home on individual or domestic visa. 6. If your Iqama is already expired, Check your "Muqeem Validity" through MOI. 7. If the employee status is runaway from the employer. Similar article "remove huroob in Saudi Arabia". 8. 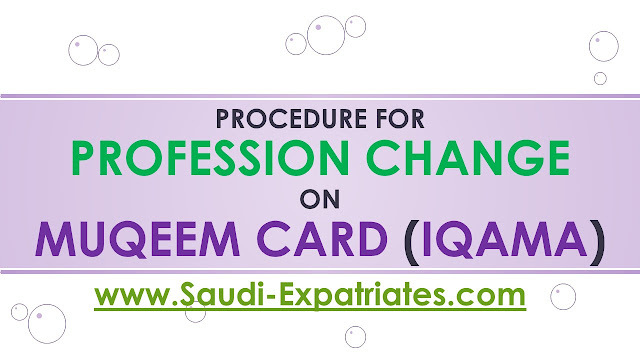 If you are already applied and waiting for your Iqama, Check your profession change status through this article "Muqeem Profession Status".